Employers shrugged off the federal government shutdown last month to hire workers at a rate exceeding even the most optimistic expectations. Despite facing constant and varied headwinds throughout the year, the economic and employment recovery appear quite broad and self-sustaining, setting the stage for potentially greater economic growth in the fourth quarter. The U.S. economy remains firmly on track to add more than 2.2 million jobs this year, exceeding last year’s total by a slender margin. 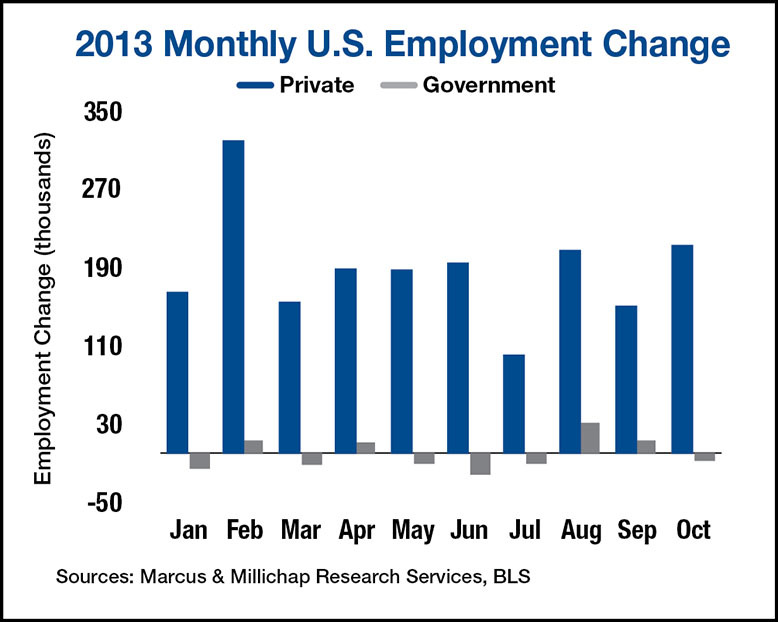 With additions in all 10 private-employment sectors, employers added 204,000 jobs in October. The preceding two months were also revised significantly upward, reflecting economic growth that expanded at a much greater rate than expected. With the increase in payrolls so far this year, roughly 83 percent of the 8.7 million positions lost during the recession have been recovered. In October, trade, transportation and utilities employers expanded, supported by a gain of more than 44,000 retail positions, as stores started to add seasonal workers. Wages and salaries continue to rise, indicating that the holiday shopping season may turn out stronger than expected despite one less weekend between Thanksgiving and Christmas than one year ago. The effects of higher wages and salaries is also evident in employment at bars and restaurants, where the more than 29,000 jobs added last month accounted for most of the gain in leisure and hospitality staff levels. Among the other employment sectors hiring, manufacturers recovered from lackluster job creation in the third quarter to add 19,000 workers last month. Transportation equipment plants expanded payrolls as the auto industry continued to grow, while a revival of the single-family home market supported a gain of 3,400 positions at furniture mills. The expansion of manufacturing payrolls is consistent with an uptick in a gauge of manufacturing activity last month, which also showed a gain in new orders, suggesting continued vigor at the nation’s factories in the months ahead. Consistent job growth continues to fuel the formation of new rental households and sustain a robust national apartment sector. Nationwide vacancy ticked down 10 basis points in the third quarter to 4.6 percent, the lowest level in six years, and rents also advanced. Strong tenant demand generators and property operations are supporting a liquid investment market. With economic growth proving sustainable and encompassing a greater array of metros, investors will step up efforts to identify acquisition targets in secondary and tertiary metros. The national office market appears positioned for an imminent upswing in property operations. Employers added nearly 53,000 full-time office-using positions last month, raising to more than 1 million the number of such jobs created in the past two years. Newly hired workers are filling under-utilized spaces and further gains will prompt a renewed consideration of larger layouts by tenants. This year, the national office vacancy rate will decline 70 basis points to 15.9 percent behind a slight increase in demand and only nominal supply growth. This entry was written by marcusmillichap, posted on November 8, 2013 at 8:54 pm, filed under Uncategorized and tagged CRE, Employment, Jobs. Bookmark the permalink. Follow any comments here with the RSS feed for this post. Post a comment or leave a trackback: Trackback URL.